Weslaco city commisioner Jerry Tafolla looks over piles of debris as Weslaco commissioners and staff tour post-storm damage, clean up and drainage systems in a small bus Tuesday, July 17, 2018, in Weslaco. WESLACO — City leaders toured flood-damaged neighborhoods Tuesday as part of a workshop concerning the recent rain event, which left them fielding heated concerns from residents who demand costly improvements to drainage infrastructure. 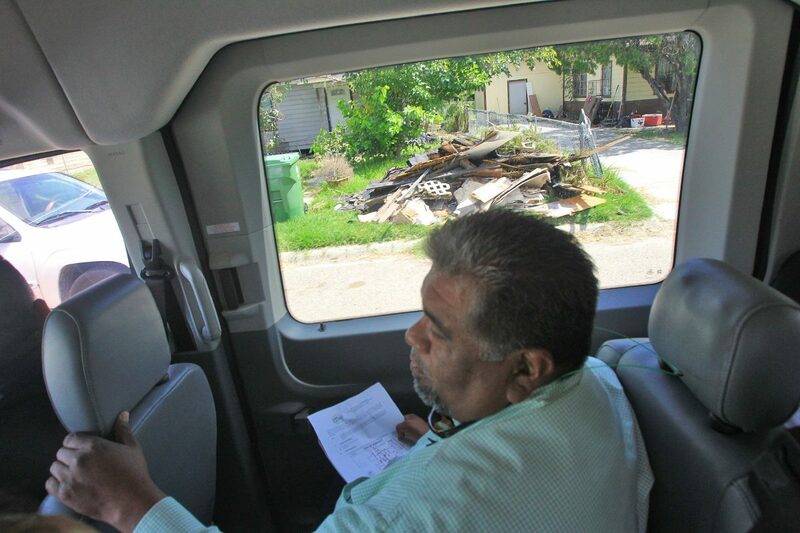 Driven by Emergency Manager Tony Lopez, members of the commission and city management departed City Hall and traveled through affected neighborhoods, including the Las Brisas subdivision, where dozens of homes were flooded with waist-deep water, leaving them severely damaged last month and in need of repairs. “What’s happening right now is they don’t have a lot of trust (in their city government),” City Manager Mike Perez said of the residents who sustained damage caused by the June 20 flood that impacted about 20 percent of homes in the city. The group came upon a home where, a few weeks prior, three residents were rescued by boat near San Benito Street. A motorized wheelchair damaged in the flood was left in the front yard of a brick home, unable to be used by a resident who required it. 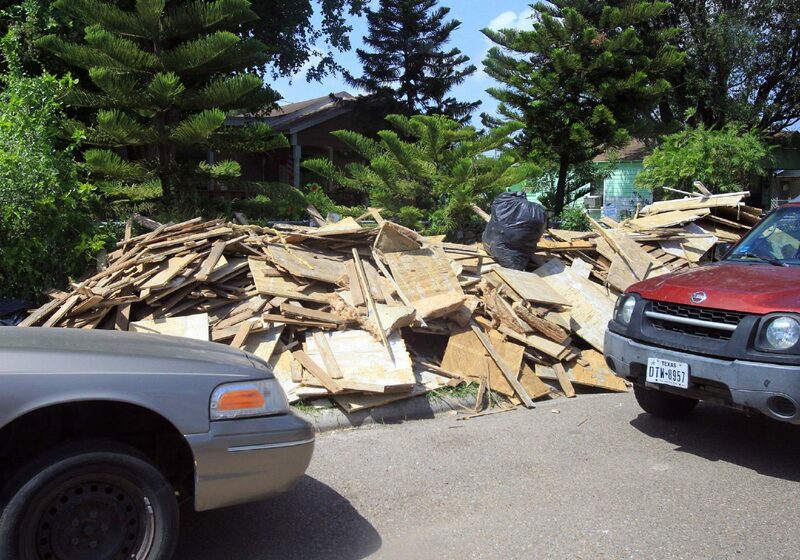 Debris sits piled in front of a home in a neighborhood as Weslaco commissioners and staff tour post-storm damage, clean up and drainage systems in a small bus Tuesday, July 17, 2018, in Weslaco. 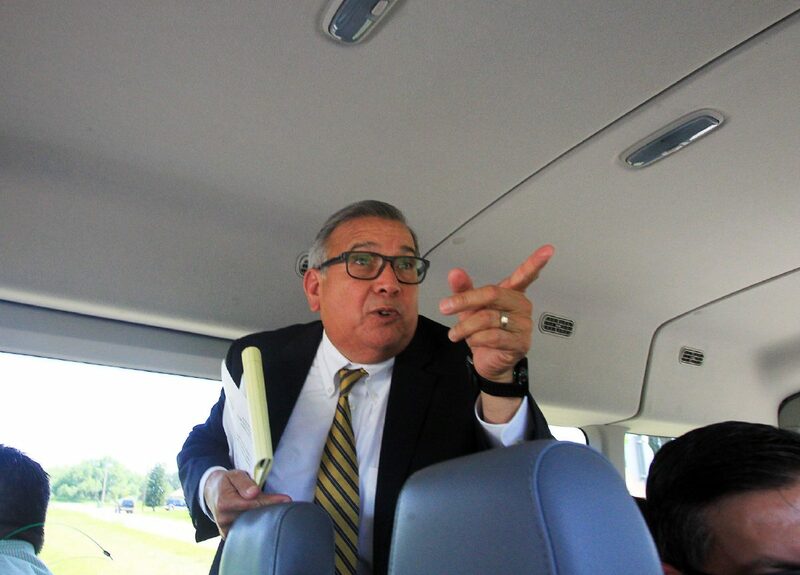 Weslaco City Manager Mike Perez points out damage as Weslaco commissioners and staff tour post-storm damage, clean up and drainage systems in a small bus Tuesday, July 17, 2018, in Weslaco. 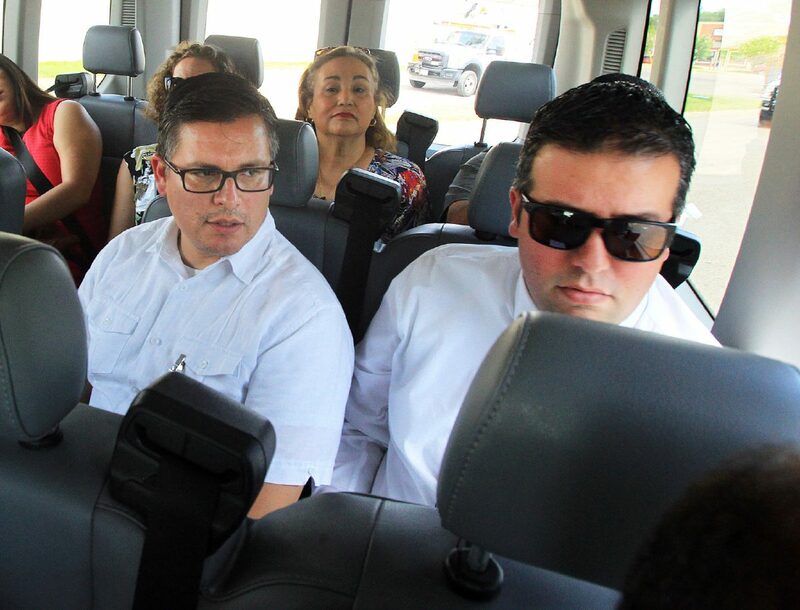 Weslaco City Commissioner, left, Jose Rodriguez and City of Weslaco Planning Director, Mardoqueo Hinojosa, look over storm damage in neighborhoods as Weslaco commissioners and staff tour post-storm damage, clean up and drainage systems in a small bus Tuesday, July 17, 2018, in Weslaco. “He’s just going to fix it, sell it and move,” said City Commissioner Jerry Tafolla of another homeowner. Commissioners, with the exception of District 2 Commissioner Greg Kerr, heard from Perez regarding the size of pipes and boxes, which allow for the movement of water into ditches. The commissioners, often empathetic toward their constituents who were displaced temporarily from their homes, seek a solution to prevent flooding caused by heavy rainfall last month and in 2015. The solutions, though, come at a cost. The Hidalgo County Appraisal District could soon conduct appraisals in flooded neighborhoods to help residents financially, allowing them to potentially pay less in property taxes for 2019, according to Perez, who made the request. The group talked near Harlon Block Park where they spoke to resident Randy Hall, who rode with Mayor David Suarez in a separate vehicle behind the van commissioners traveled in. Commissioners may consider creating a detention pond, to hold water, in the park located near a ditch. The bus then returned back to city hall prior to the regularly scheduled City Commission meeting where residents continued to plead for improvements, to alleviate the potential of flooding, with city administration and commissioners. The commission plans on looking at short-term solutions, like the issuance of certificates of obligation to pay for immediate needs such as the cleaning of pipes under roads and highways to speed up the flow of water. Currently, the city is paying workers to secure three sites where water pumps are stationed for potentially the remainder of hurricane season. The pumps were used during the flood, one to pump water over the levee for quicker removal. Commissioners now look to hire an engineer firm to conduct an assessment detailing potential long-term solutions — likely requiring voters to approve a bond. “We can cut a little bit here, a little bit there, but nothing to the amount (needed) to be able to fix this problem,” Perez said. The commission will likely hold a workshop and special meeting next week to further delve into potential solutions, Suarez said. A bond election may take place in 2019.